Since 1989, Robertson Languages International has been providing award-winning language training services to companies based in the UK and around the world. Our experienced team are passionate about what they do and possess a love of languages that guarantees our industry-leading standards. 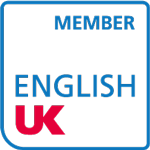 Each of our language trainers have a degree, at least two years of teaching experience and a CELTA accreditation or another qualification recognised by the British Council. We offer tailored, flexible, science-based language training for busy professionals, both face-to-face and online. Our methodology is based on both scientific research and practical strategies: a combination which practically guarantees your success.